: Wont be a moment. Sorry there are no images available for this apartment. Nestled in Manchester's bohemian Northern Quarter, surrounded by boutique shops, independent coffee shops, and trendy bars, these exclusive serviced apartments are an ideal hotel alternative for those visiting for business or leisure. Manchester Victoria station is a ten-minute walk away, granting access to the rest of the city and surrounding areas. Manchester Piccadilly and Exchange Square are also reachable on foot. Each penthouse apartment sleeps up to six people in three beautifully furnished bedrooms, that guarantee guests a comfortable stay. The living and dining area is stylishly designed, and features a home entertainment system, perfect for unwinding or entertaining. There is a fully fitted kitchen with modern, integrated appliances. Three luxurious en suite bathrooms, one with a stand-alone bath, complete this premium accommodation. You can make a booking by using the form below. Once we have your details, one of our reservations team will call or email you back with a competitive quotation. Please note: all our apartments operate a 3 night minimum stay. Thank you, your form has been submitted and one of our reservations team will be in touch with you shortly. “When pricing for a project, we always have to work with a very tight budget. 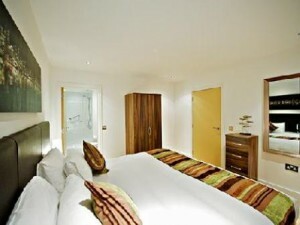 Serviced City Pads always manage to provide us with excellent rates". “I have been using Serviced City Pads for over a year now and I have always been very satisfied with the apartments I have stayed at in Central London.". "Using Serviced City Pads is a simple process; all we have to do is give our account manager a call, or send an email with our accommodation requirements and they do the rest."